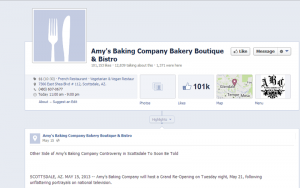 The now-empty facebook page of “Kitchen Nightmares” failure, Amy’s Baking Company. As someone who doesn’t watch a ton of TV, I was lucky enough to catch the tail end of a disastrous “Kitchen Nightmares” episode. This episode was also the first time in the history of the show that the famous Chef Gordon Ramsay was unable to help the restaurant – Amy’s Baking Company – who have become the latest Internet sensation in the category of social media meltdowns. The deplorable and often odd behavior witnessed on the episode by the restaurant owners, Amy and Samy Bouzaglo, naturally spurred comments from the public via social media – and in typical trolling fashion. Comments that lead to vitriolic replies from what was presumed to be the owners, who swore at, insulted and threatened legal action against the posters. 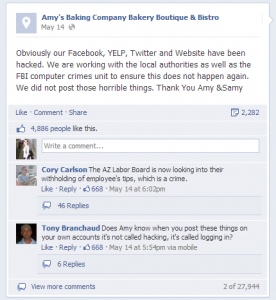 Subsequent posts by Amy’s Baking Company claimed their social media pages and website had been hacked and that the owners were not responsible for the tirade. These posts were met by general disbelief of the internet population. Is There Such A Thing As Bad Press? You don’t have to be big to go viral in a negative way. Sure, Amy’s Baking Company saw an enormous increase in page activity, up to 101,153 Likes at time of writing, but is negative activity good activity? There’s the old saying “there’s no such thing as bad press”, but can they really recover? The reason they went on Fox’s “Kitchen Nightmares” in the first place was because their business was failing, and now they’ve gained the reputation of being crazy, and having awful food and service. They had a reputation for yelling at customers and kicking them out of the restaurant – behavior that was mirrored perfectly in their social media meltdown. If they had planned for this kind of fallout with online reputation management, they may not be the same, infamous, viral sensation. According to a 2011 study by the Pew Internet & American Life Project, about 60% of all adults get information about local businesses from search engines and entertainment websites like Yelp & TripAdvisor. Most small businesses don’t have great brand recognition or recall. In large areas, small businesses can be practically invisible without an online presence. With limited budgets and experience, small businesses already face challenges building online and social media presences, let alone managing them effectively and professionally. Fear of negative reviews and embarrassment can keep them away from even considering it – but they stand to lose a lot if they don’t. According to Forrester, 80% of all B2C and B2B purchases involved some form of word-of-mouth recommendation during the purchase cycle. The internet is becoming one of the fastest and most-relied-upon word-of-mouth vehicles available. Larger businesses do not always face these same challenges as SMB’s due to their large presence, branding, and budgets. According to social media experts, it’s not always about the fact that there is a negative review or negative comments to the reader, but about how the company responds to it – and they should respond 100% of the time. If businesses do not have the in house talent to manage it, there are many options for help. Firms like ours have cost-effective solutions where we can help manage online presences and social media, as well as have plans in place for what to do when negative comments are received. Having resources for online reputation management can help small or medium sized businesses thrive. Reputation is everything when there is no established connection to a business or brand, which is why people rely on evidence that’s in front of them like appearance, availability, and reviews. 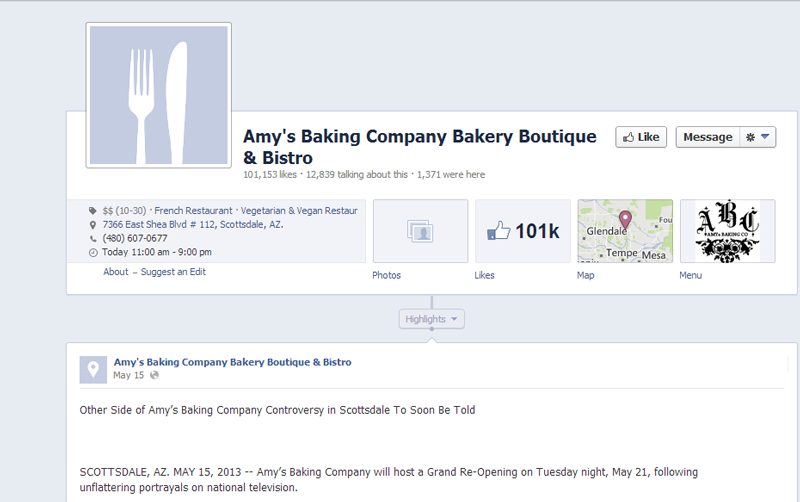 Today, the Amy’s Baking Company facebook page stands empty of all, and free from their infamous tirade. In it’s place is the message, “Obviously our Facebook, YELP, Twitter and Website have been hacked. We are working with the local authorities as well as the FBI computer crimes unit to ensure this does not happen again. We did not post those horrible things. Thank You Amy &Samy”. Though the page has been cleansed of the meltdown, this is the internet, where screenshots and stories live on forever. The damage has been done and that is nearly impossible erase. If they’d had online reputation management services, their tempers would not have gotten the best of them that one fateful night. You can avoid the same thing by contacting a firm like ours for online reputation management services or training. Sharing is caring! Use the social media buttons below to share with your friends and followers.